Our first major building expansion came in 1997 with the completion of our brand new 40,000 square foot manufacturing plant in the nearby Dorchester industrial park. 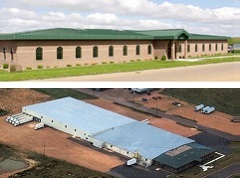 Three years later a new 13,000 square foot office was added to the new plant. Continued growth in 2004 resulted in adding 60,000 square feet of manufacturing to the new Dorchester plant. This addition brought production capacity at Dorchester to 100,000 square feet and a combined 125,000 square feet of manufacturing. The original Parrett facility was built in 1982. Throughout the years this facility has had multiple additions and served as the main office from 1982 to 2000. The Stetsonville plant is still in full operation today and has a capacity of 25,000 square feet of space for millwork, storage, and specialty product lines. Operating out of both the Stetsonville plant and the Dorchester plant Parrett now employs a quality team comprised of 135 employees. Our main office and operation is our Dorchester operation however the Stetsonville plant still provides invaluable millwork products filling out our product line. Combined Parrett produces outstanding quality and value in specialty millwork products for the residential, historic, church and light commercial markets.